Ocean view at the Kealia Resort on Sugar Beach! 1 Bedroom, 1 Bath, Suite Sleeps 5. Beautiful ocean view condo on Sugar Beach! Located on Sugar Beach, Maui's longest white-sand beach. With gorgeous views, this beautifully decorated, fourth floor, condo at the Kealia Resort beachfront complex is waiting for you! The six-mile stretch of beach, calm waters, and close proximity to town, make it the perfect vacation spot for honeymooners, families, and everyone in between! Right on top of the beach, you are literally 40 feet from the water. Enjoy whale watching from your balcony/lanai (in the winter months), snorkel with green turtles, swim, jog, and play on the beach. With the spectacular ocean view, you'll experience peaceful mornings and romantic sunset evenings. Experience Paradise and Aloha in a wonderful Maui Oceanview Condo! Great weather and beautiful beaches. The Kealia Resort is located right on the beach, you can't get any closer to the water. It is beautifully situated on a six mile stretch of uncrowded, serene beach, with calm waters. The weather on this side of the island is almost always sunny, less than 12 inches of rain per year. Our family has been vacationing on this beach (Sugar Beach) since 1976. We absolutely love it. Located on World Famous Sugar Beach. Miles of soft sand, gentle waters and whale watching (in season). We provide 500 count linens for the King Bed, additional linens for Queen Sofa Sleeper and twin Day Bed. All bath and hand towels provided. Beach Towels also provided. There are a few seasonings available above the stove. Great view! Great place; I enjoyed my stay and was very comfortable. The bed was extremely comfortable and I slept well each night and woke up rested each morning which is most important to me. I was serenaded by the birds and ocean waves and enjoyed the peace and quiet. I was only one and enjoyed the size of the place, but it could easily accommodate a small family. Pros: good location, beautiful view from balcony, owners responded quick to all my questions, umbrellas, beach chairs, and childs safety vest included. Cons: first day we got to the condo there was a dead roach in the bedroom entrance. Then, we saw multiple roaches during our stay. We saw roach eggs in plates and small dead roaches inside the shower door rail. It was definitely a roach infestation. The place needs some serious pest control. Also, they left us with very few cleaning supplies for the 13 nights. When I say few cleaning supplies I mean, they left us 1 paper towel roll, 2 trash bags, and 2 toilet paper rolls. Overall, we had a great time but the roaches and the lack of cleaning supplies made it a little more than difficult for us. Thank you for your feedback! We do have regular pest control but have scheduled an extra visit thanks to your feedback. There has been a lot of rain in Kihei this year and the warm, tropical climate brings these unwanted visitors out quickly. For our guests we encourage you to please contact us as soon as you see anything that is concerning so we can address it quickly and you can enjoy your stay as much as possible. We are on-island and more than happy to assist - we're just a phone call and email away. Thank you again - we're glad you enjoyed your visit to Maui! Nice room with great amenities. Perfect for families. Very quite and relaxing atmosphere. Loved the option of going to the pool or the beach. Really enjoyed our time at the Kaelia #406. Our unit had everything we needed, including beach chairs and umbrella. The screen door was broken, and it would have been nice to have a few small things at the condo like sugar for coffee and cooking spray etc, but everything else was as it should be. Had a small issue with WiFi but owners were quick to respond and remedy. Nice kitchen and AC units helped a lot with the hot weather. Will definitely be back! Great views and location! On the beach and convienent to stores and local restaurants. Very nice location! Nice view of the beach and easy access. They were painting the building when we arrived and they moved all of the equipment the next day. Bathroom was a little small but it was a updated and a clean condo. 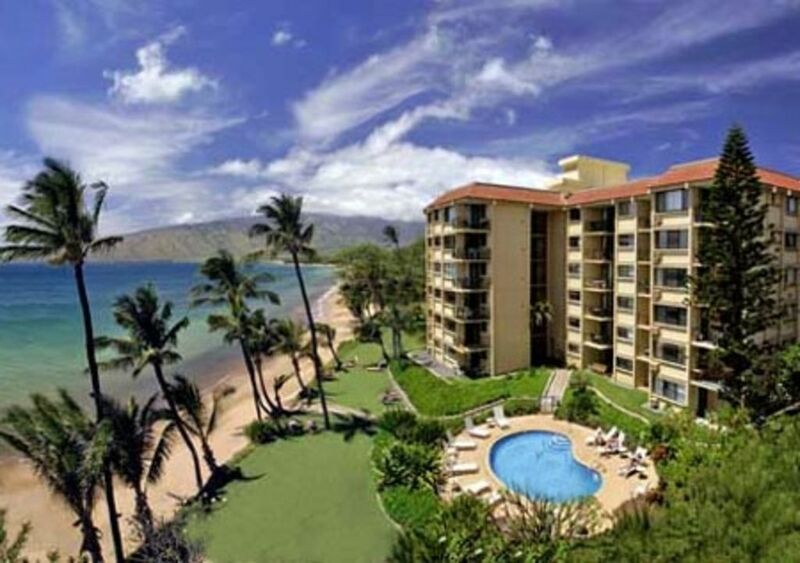 The Kealia Resort is conveniently located on beautiful Sugar Beach in Kihei. A favorite destination for returning visitors. The Kealia Resort and this condo are located directly on the beach, not across the street and not across a parking lot. Located in North Kihei, the Kealia is centrally located on Maui, making it convenient to get to just about anywhere on the island. Siteseeing, golf, shopping, groceries, dining, and The Maui Ocean Center are a short 5-10-minute drive away.